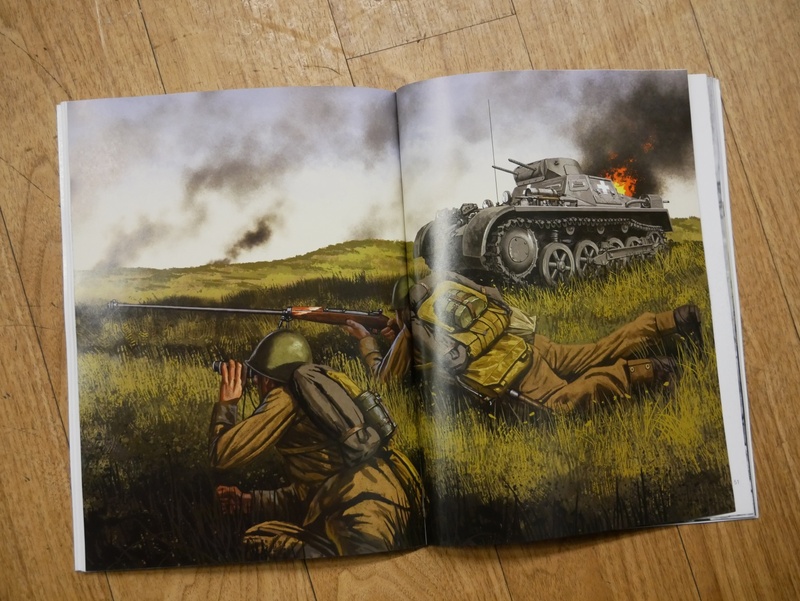 Osprey Publications has recently come out with a new title in the Weapon Series of books, “The Anti-Tank Rifle”. It is a light history of the anti-tank rifle from the First World War to the beginning of the Cold War. For those not familiar with the Weapon Series from Osprey Publications, the series of books are designed to give a well laid out and explained (but easy to read) description of a particular small arm over the course of 80 pages. It is supplemented with artwork and high-quality photographs. The Weapon Series of books isn’t supposed to be a definitive guide, but instead more of a survey for those wishing to expand their knowledge in regards to any particular small arm. 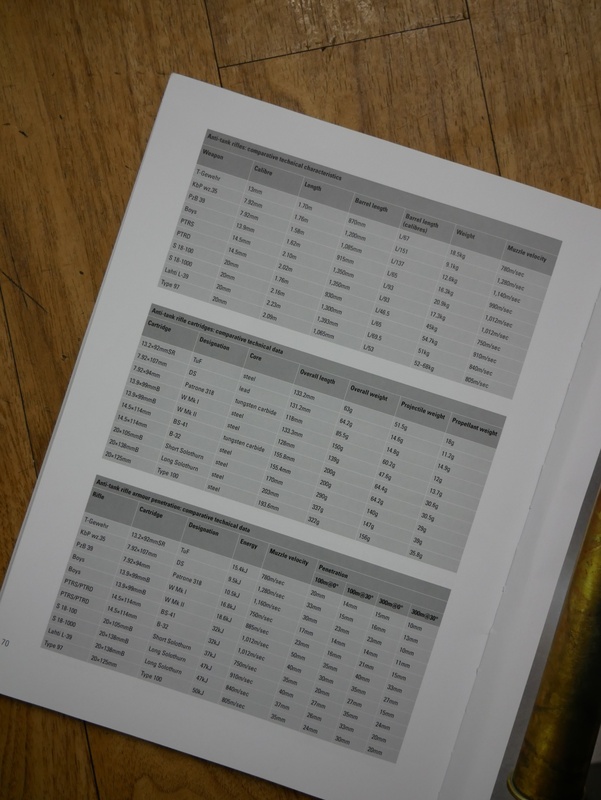 Steve Zaloga does an excellent job of dividing the book into two sections of information. The first section is concerned with the mechanical and procurement aspects of the anti-tank rifles that each country produced. While the second section deals with the actual effects in combat that each rifle had, both positive and negative. 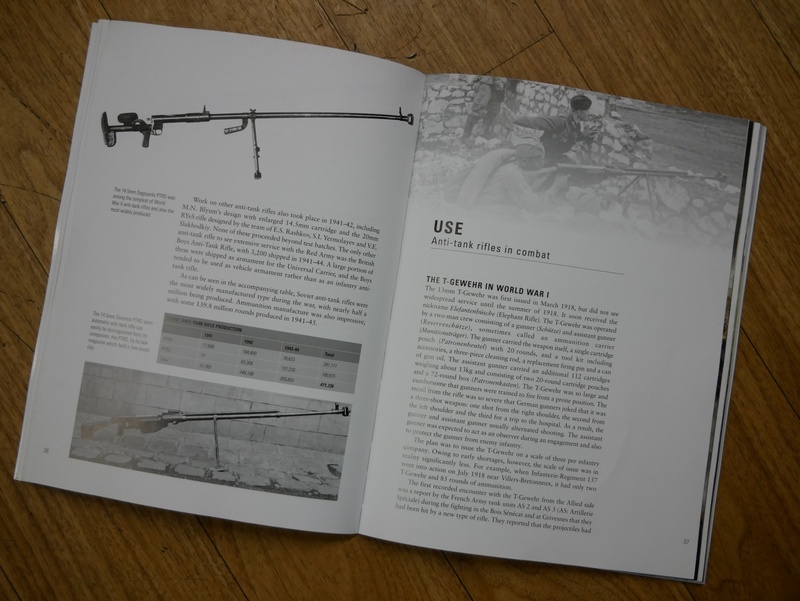 Through the pages of “The Anti-Tank Rifle”, Steven Zaloga leads the reader through the initial requirement and subsequent development of the anti-tank rifle by a number of the combatant countries that produced them during the two World Wars and the interwar years. Almost to a country, it is readily apparent that there were several central issues that accompanied these heavy, man-portable, infantry rifles throughout the wars. The first, and most glaring, issue was that anti-tank rifles were only marginally effective, even under the best of conditions. Although they were designed to penetrate an opposing foes tank armor (up to 25mm in some cases), very few of the rounds used would actually finish the job. Hopefully, one of the rounds would have enough energy to kill, or wound, the armored crew (or damage a mechanical feature leading to a mobility kill). The kill was completely contingent on the right conditions being met, the thickness of the armor, the angle at which the vehicle was bladed to the shooter, and the range of the target. Even with all of those four conditions being met, over the course of the war, countries would upgrade their vehicles to the point where the anti-tank rifle in its original employment was essentially over. Anti-tank rifles soon found other roles during the war, much like anti-materiel rifles today filling an anti-personal role. Another issue was the complete lack of oversight and intelligence when it came to developing and fielding anti-tank rifles. Defense industry completely supported the endeavor, building whatever fit the requirements that the various military procurement agencies blindly set forth. As an example, the .55 Caliber Boys anti-tank rifle was initially adopted in 1936 with a cartridge that was completely inferior to what the German Army had introduced with the T- Gewehr almost two decades earlier (S.A Armour Piercing .55in W Mk I). In another example of an intelligence failure when it comes to anti-tank rifle design, the entire German anti-tank rifle inventory essentially went obsolete merely a year or two into fielding by the introduction of the Soviet T34 tank. However much disdain was apparent for the early (to mid 20th Century) anti-tank rifle, it must be noted that, in their early development, they were seen as special weapons. The German T-Gewher was under such secrecy that only the U-Boat programs were held in a more confidential status. In the case of the Polish 7.92mm wz.35, the rifles had the nomenclature of “Uruguay” to confuse Soviet and German intelligence officers into thinking it was an export program to Uruguay instead of a combat rifle. Many of these rifles were treated with such secrecy that they were delivered to their units in boxes under orders not to be opened until a certain command was given. For some units that command wasn’t given until after the war began in September of 1939. Germany’s entry into anti-tank rifles in the First World War was purely reactive as the British came up with tanks first. Their result was one of the most uncomfortable rifles to shoot, and apparently, it routinely broke the collar bones of gunners using it. Poland experimented with a 7.92x107mm round, trying to make the .30 Caliber round “speed” through armor at great velocity. Unfortunately, this left the Poles with a barrel life of 20-30 rounds. The solution was an odd one when a Polish designer found out that the round wouldn’t have to even penetrate the hull of a tank as long as it knocked spall out from the inside. An odd concept indeed but the wz.35 was one of the most used anti-tank rifles by both the Poles and the Germans in the early years of the war. The semi-automatic PTRS designed by Simonov and the bolt action single shot designed by Degtyarev were actually competing designs with each other, but the Soviets needed everything they could throw at the German advance so took both trial guns and threw them into production. These were also the most widely produced anti-tank rifles of the entire war, numbering in several hundred thousand. Unfortunately, their effectiveness couldn’t match the German tanks. Zaloga has a quoted account where a Soviet Infantrymen recounts that 45 anti-tank teams (two men per) were killed in a single action over several days in 1943. This was by far the heaviest rifle of the war used by one of the bigger combatants. Coming in at almost 68 kilograms fully equipped, the Type 97’s 20x125mm round could only penetrate 35mm of armor at 100 meters. Compared to the PTRS/PTRD in 14.5x114mm round that could do 50mm at the same distance. The eclipse for the anti-tank rifle was the improvement of vehicular armor, vastly improved anti-tank light artillery/field guns, and the advent of the rocket-propelled anti-tank launcher that fired shaped charged explosives. It clearly became apparent that using up several soldiers for the purposes of supporting, moving, and protecting an anti-tank rifle was extremely inefficient when compared to the effectiveness of a single soldier with a Panzerschrek or 2.36-inch Bazooka. My only real complaint with the book is that it really should have included at least a paragraph or two on the resurgence of the anti-materiel rifle in modern warfare. We’ve seen more domestic, improvised production, and field use of anti-materiel rifles in Syria and Iraq in the past several years than we have almost anywhere else. The author dedicates a single sentence to some PTRD rifles appearing in Ukraine and then another sentence mentioning that anti-tank rifles are the forerunners of the current day anti-materiel rifle. The Anti-Tank Rifle by Steven Zaloga is available on Amazon for $13.39 in the United States.